Image credit: Christian Moso, Australian Beauty, Finalist Way Out West Youth Photography Competition 2018. All branches will be closed from Friday 19 April – Monday 22 April for the Easter Public Holidays and on Thursday 25 April for the ANZAC Day Public Holiday. NATIONAL RECONCILIATION WEEK National Reconciliation Week is a time for all Australians to learn about our shared histories, cultures and achievements. It’s an opportunity for us to explore how we can contribute to creating a nation strengthened by respectful relationships between Aboriginal and Torres Strait Islander peoples and the wider Australian community. LIBRARIES CHANGE LIVES Libraries Change Lives is a three year, statewide campaign run by the State Library of Victoria and the Public Libraries Victoria Network to ensure ongoing government support for Victorian Public libraries. Public libraries build literate, productive and engaged communities and generate $4.30 in benefit for every dollar invested. 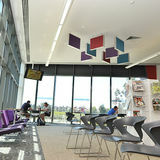 Further information on the campaign can be found at www.librarieschangelives.org.au We want to hear from you, the community. We will be running several events and competitions to share your stories about what Wyndham Libraries mean to you. Look out for more details on our website and in the Library’s What’s On. Love Letters to the Library Thanks to everyone who entered ‘Love Letters to the Library’ competition! Check out this great entry submitted by one of our regulars. Star Wars Week Madness Ages 3-12 Dress up and celebrate everything Star Wars! Join the Scavenger Hunt, do some colouring, make a craft, take some photos or borrow from our Star Wars book display. Check in at Kids Club Story Time your local branch or see the Events Calendar to find out Ages 7-12 Ages 3-9 Dress up and celebrate everything Join us for a special Star Wars what activities are on at Star Wars! Join in the Star Wars themed Story Time with a take your library. All branches themed scavenger hunt, create home craft activity. Star Wars themed craft or make Bookings required. Monday 29 April – a space ship. Bookings required. Julia Gillard Library Tarneit Saturday 4 May Julia Gillard Library Tarneit Saturday 4 May Monday 29 April 10.30am – 11am 4pm – 4.45pm Jedi Masterclass 7-12 years Dress up and celebrate everything Star Wars. Learn the secrets of becoming a Jedi Knight under the watchful eye of Jedi Masters in this Academy workshop. Special appearance by Darth Vader. 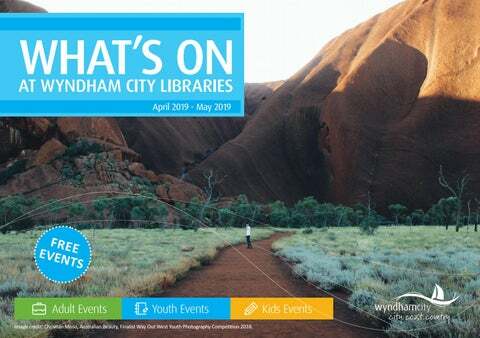 Free events for Kids, Youth and Adults at Wyndham City Libraries!